Was in Asda today and they were either £5 or £4 I cant remember. Went to the Sainsburys in Peterborough this morning and said very loudly that the salmon in Tesco's was £5 a KG and £4 a KG in Asda. Think they felt embarrassed that theirs was priced at £9 a KG. Asda is £4 a kilo I am reliably informed. Asda is 4 and tesco is 5 but apparently tesco will clean it and cut it for you. Unfortunately for me bought a massive sainsburys one (which is uncleaned) and froze for Xmas. Would have preferred it cut and cleaned for same money. Went to the Sainsburys in Peterborough this morning and said very loudly … Went to the Sainsburys in Peterborough this morning and said very loudly that the salmon in Tesco's was £5 a KG and £4 a KG in Asda. Think they felt embarrassed that theirs was priced at £9 a KG. Oh no I wish I knew!!!! If you ask I know Sainsburys will ethier Steak it for you or fillet it, or just have it how it is. 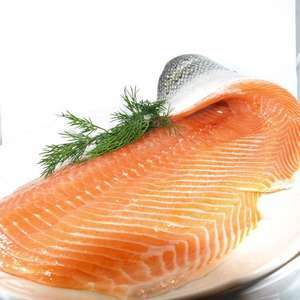 its £5 per kilo for whole or they also sell fillets for £9 per kilo which you can also have cut to size. one thing to remember is on average 40% to 60% of what you pay is waste on whole salmon as paying for head and bones etc..
Nah - you made their day! Salmon sides are £8 kg in tesco. I also like puppies, but forgot to mention that. I saw salmon fillet in Asda @ £8/kg, but then I realised that the whole salmon was only £6/kg. I ended up buying the whole salmon. Now that you made it clear that 40-60% are wasted on head and bones (which I asked the staff to throw away for me), not sure if it is cheaper to just pay £8/kg for the fillet. Any idea guys? The head and bones can be used to make fish stock. I had to walk out of Sainsburys in Peterborough because a horrible person was shouting. Crept up to £6/kg at Sainsburys today.